In a self-contained and rigid paradigm of cause and affect, of action and reaction, the potential for freedom or choice is merely an illusion, a deception of what truly is. Yet, as we sit down to the Seder on Passover night, we aspire to reach and dream of experiencing such freedom. This genuine freedom is what existentialists would call ‘radical freedom’ — where we choose something, not out of any unconscious reflex, but out of our deep still center, ‘just because’, uninfluenced and non- reactive. But is this freedom actually attainable? Is not every choice determined by a previous choice? In a created and evolving universe, once something is set into motion, the ripple effects are interminable. Every effect can be traced back to a cause, and the cause in turn is merely an effect of a previous cause. Such is the nature of a closed system. This is referred to in Kabbalistic language as ‘seder histalshelus-evolving order.’ On Pesach-Passover night, however, we are given the power to tap into a space beyond ‘seder hishtalshelus,’ beyond the perpetual pendulum of cause and effect. And we are given the opportunity to access genuine, radical freedom. Doing so in this potent and poetic ritual offers us the ability to articulate our experience of freedom , of being beyond seder/order, throughout the ‘seder-order of the coming year. Before leapfrogging to a state of being beyond order we need to secure the vessels of order, as only “a filled vessel is able to receive.” Before we begin reciting the hagadah, which speaks of freedom, we must ensure that we are prepared for the experience, so that later on we are able to integrate the experience of being ‘beyond order’ within the workings of ‘order’ and the natural flow of life. 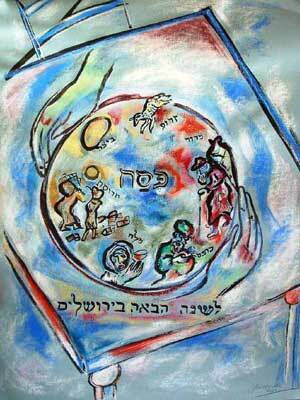 Let’s begin by understanding the process of seder histalshelus on a cosmic level. Initially there was and is only ‘or ein sof- the endless light,’ absolute oneness and unity. Thus, finite reality as we know it and understand it to be, couldn’t have merged. To create otherness and apparent separation there was a great tzimtzum –contraction and concealment-of the or ein sof within itself–, thus “making space” for the finite to come into focus. The first otherness that took shape was ‘formed’ as an igul- a circle. The image is of a circular space in which all potential reality was contained within as one, non-individuated, non-distinct, with no beginning and no end. Within this circle was formed a line, a kav, with distinct points, a linear sequential structure and a clear beginning with a definite end. These original points along this line are the ten sefiros, and it is through these ten screens or lenses that the infinite light of the or ein sof penetrates our reality. The distinctly ‘formed,’ ‘shaped’ and ‘colored’ sefiros serve as curtains or containers through which the infinite colorless, formless, unified light is reflected into our world, albeit in a way that seems differentiated and colored in order for us to be able to perceive and process it. First there are the three intellectual sefiros: chochmah—intuition and wisdom, binah-cognition and reason, and da’as-knowledge and awareness. Next are the three primary ‘internal emotions’: on the right expansive column is chesed—love and giving. On the left restrictive column is gevurah-strength and restraint. In the middle is their synthesis, tiferes-compassion and harmony. Tiferes is the balance that is struck when the ‘giver’ gives with a sensitivity of how much the ‘receiver’ is able to receive. The ‘outer’ emotions are also divided into three: on the right expansive column is netzach—confidence and perseverance. On the left column is hod—humility and devotion, and in the middle is the unifying agent, connecting the ‘giver’ and the ‘receiver,’ the foundation of yesod—relationship and intimacy. Malchus-kingship is receptiveness, as it represents the vessel that receives from the preceding nine sefiros and re-channels the energies downward, thus becoming the ‘crown’ for the subsequent partzuf-structure of sefiros. Next we arrange six items of food in two upside-down triangles, the triangles reflecting the three internal and three outer emotions respectively. Collectively these six items represent six points of light, the six emotional sefiros. On the upper right side of the plate the zeroah-shank bone is arranged. The Hebrew word zeroah reminds us of the zeroah netuya-, the outstretched arm, the divine chesed-loving kindness that was shown to us, that brought us our salvation. On the opposite side, on the upper left column we place the beitza-, the egg. The egg is a traditional food of mourning, as the oval shape represents the circle of life with its ups and downs. The egg is associated with gevurah-restraint and restriction, a time of loss, when there is a concealment of apparent kindness. In the middle, at the third point of the triangle, maror-bitter herbs are arranged reflecting the attribute of tiferes-mercy and compassion. Becoming aware of our own spiritual condition may arouse a bitterness within and provoke divine compassion. Besides, when we, through external stimuli, feel pain we awaken our own ability to be empathetic to others who are truly in pain. Next we arrange the lower triangle, reflecting the outer emotional sefiros. On the lower right column we place the charoses, which is a mixture of various fruits that are crushed into a liquid like form. The charoses corresponds to the sefira of netzach, as the charoses is comprised of fruits of trees, growing tall and mighty, mirroring the energy of confidence and perseverance. Across, on the lower left column we arrange the karpas, a vegetable, either an onion or potato. The karpas reflects the idea of hod-humility, as vegetables, in contrast to fruit, grow within or in close proximity to the earth. In fact, in the word karpas one can find the words caf-palm and ras-poor, the hand of the poor open to receive in its humility. In the lower middle column the chazeres is placed. The chazeres is the bitter herbs that will be eventually used in the Hillel sandwich. Chazeres reflects the sefira of yesod, the connecting force, that which binds together, as the chazeres is sensitive and will unify the entire internal structure of the seder, bringing together freedom and exile, affliction and salvation, unifying the matzah – the bread of liberation – with the maror, which represents our suffering and pain. All the above is placed on the actual plate, which is malchus, the vessel and container of all the points of light. May your seder be truly expansive and redemptive!